I literally sat in front of my computer and scrolled through every single dish I ate this year. When I was finished, I did it again. And then again. Eight years ago, I surveyed all of the dishes I had eaten in that year and compiled a list of my favorites, more for my own record than for posterity. Since, it has become an annual tradition. Considering the two incredibly packed years that preceded it, it’s unbelievable that 2013 was busier. I spent more time traveling and eating this year than any year before it. Like last year, this year, I continued to find joy in simplicity. Dishes that focused on the integrity of products pleased me more than those that were unique or interesting. Many of my favorite dishes this year did nothing more than celebrate one or two excellent ingredients. Some of them explored texture in wonderful ways. Others took me through foreign lands. But the destination in all of them was flavor. Don’t be fooled. Although much of what you’ll find listed below seem like uncomplicated propositions – a roasted rib, a slice of smoked fish, a tortilla and some sauce, a rustic stew, or some porridge – all of them demonstrated a sophistication and confidence that only a skilled craftsman could produce. This year’s list is comprised of dishes from all over the world – the dusty Hill Country of Texas, the destination tables of Denmark, and a Michelin-starred gem in the 16th arrondissement. I found a couple of them among the archipelagoes of the Pacific Northwest, and one at a roadside stand in Chile. Together, they proved to me that exceptional cooking can happen anywhere, and can come from anyone – even an octogenarian in a polyglot borough of New York City. It’s also worth noting that I ate quite a few of this year’s best dishes more than once. In fact, I had three of them – all three from saison – more than half a dozen times. [n.b. The frequency with which dishes from saison appear on this list (four in the top twenty-five) can be partly attributed to the fact that I ate at saison nine times this year. I’ve made disclosures about my meals at this restaurant, and others that appear on this list, and my relationship with its chef, and other chefs who appear on this list, in a prior post.] And three other dishes – all in the top ten – I’ve had twice, one of them in two slightly different versions. The fact that these dishes were among my favorites is no coincidence. Although I travel and eat widely, both at the high end and the low end, I tend to return to places that have earned my trust, providing those chefs and restaurants multiple opportunities to impress, to improve, or, simply please again. With all its accompaniments, and potato blini. Pomelo, Campari, feuille de laitue, truffe noir. Matsutake, spruce, fir, jasmine, yuzu. The last time I had saltwater-cured duck liver – at Manresa in 2010 – it made my year-end list of favorite dishes. The texture: it’s indescribably silky, unbelievably delicate. 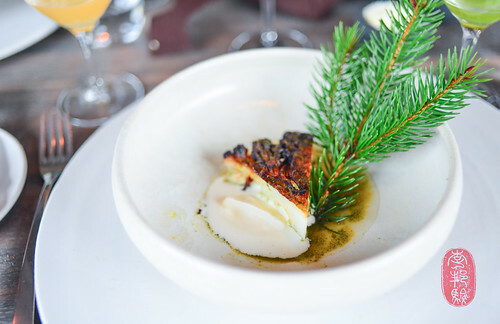 But beyond this, what made this dish exceptional is that chef Joshua Skenes used fragrance to halve its heartiness; a woodsy mix of fir and spruce, softened by jasmine and yuzu. I know. It sounds gross. But it was actually quite amazing. Scott Anderson, chef of elements, and his chef de cuisine, Mike Ryan, are avid foragers. In September, they cooked my friends and me an entire tasting menu almost entirely of mushrooms, many of which they had found, including aborted entoloma. When cooked, this bulbous, undeveloped fungus is nearly indistinguishable from sweetbreads, and has the flavor of toasted hazelnuts. So Anderson served the three together. Like I said, it was actually quite amazing. Castelmagno cheese, Australian black truffles. The “luna piena” was as perfect in form as it was delicious, a tender disk of freshly made pasta – a “full moon” – waxing with butter and truffles. Fried cod throats, dusted with vinegar powder. In a complicated world, it’s wonderful to have uncomplicated, but incredibly delicious things, like buttery nuggets of deep-fried cod throat. The outside was light and crunchy; the inside was molten and melty. Dusted with vinegar powder, it was terrific take on fish and chips. Three different mozzarella cheeses, tomato, and basil. Wrapped in brassicas, a confiture of passionfruit and potimarron. This packet of liver, wrapped in cabbage, was masterfully crafted. The liver was silky and smooth, and clean as a whistle (in my experience, monkfish liver is either glorious, or wretched; there’s very little middle ground). But what impressed me the most was that the cabbage was just as supple. I sliced through it all without resistance. This dish defies description. I can tell you what’s in it. But, even though I’ve had it over a half-dozen times, I really can’t tell you, with any sense of accuracy or confidence, how it tastes. Neither will the ingredient list prepare you for the experience. There’s duck liver, whipped until airy. There’s creamy milk, and frothy beer. There are slivers of grapefruit, tucked underneath it all, that help thin the fat and magnify the bitterness of the beer. Shattered over all of it are wispy shards of toasted bread; they help bring out the roasty flavor of the coffee oil. You’d be tempted to categorize it as a dessert. But it’s not. It’s usually served before the last meat course. So, it’s kind of a cleanser, which makes sense given that it’s oddly refreshing. Like I said, it defies description. And it’s absolutely delicious. Onions, some wild garlic, a tender slice of tongue – griddled slightly to give it some color and crust – and a drizzle of jus: that’s all this was. And it was delicious. With chorizo, clams, and aioli. The fideos at casa mono are not easy to eat. The noodles, which have been toasted with garlic and simmered with cava and chicken stock, are stacked high in a cazuela packed with clam shells. And on top, there’s a generous dollop of aioli, the flavor of which has been smoothed and sweetened by a shot of Pedro Ximenes. But, this is one of those lusty dishes – here, done particularly well – that invites you to jump in and make a delicious mess of it all. Fat and acid: when they appear in the right proportions, they make an incredible couple, one that helped put this dish on this list. I had two versions of Christopher Kostow’s aji escabeche. The first, a “fall” version was served at a regular meal in the dining room at The Restaurant at Meadowood. Kostow altered the garnishes slightly and served it again, a “winter” version, on the last night of the Twelve Days of Christmas. At the center was a beautiful slice of aji (mackerel), cured in salt to loosen up the oily meat, rendering it slippery and slack. The texture was exquisite. 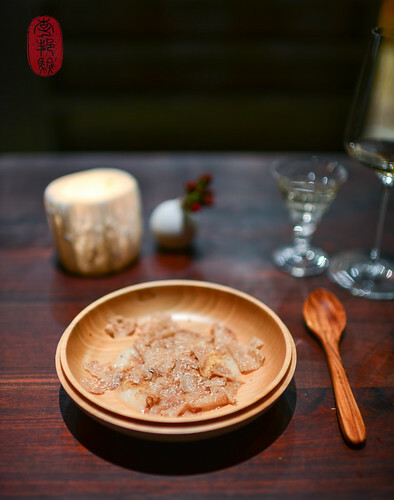 The fish was sauced with a sweet-tart escabeche liquid and glazed with a bit of dashi made from aji stock. I slightly preferred the first version, which included a variety of vegetables (slightly pickled in the escabeche liquid), apple, dill, and habenero. Boulette’s Larder, in its former iteration (I haven’t been back since it closed for renovation earlier this year. From what I understand, it essentially bifurcated into the adjacent space, opening a sister, lunch-only spot called Bouli Bar. The last time I swung through, I noticed that Boulette’s Larder is serving breakfast, and prepared foods.) was one of the most consistent restaurants I knew. Over the past few years, I’ve had nearly a dozen meals there, and every dish has been flawless. Amaryll Schwertner’s keen sense of quality and taste is apparent in everything she cooks. Last year, a simple plate of pasta with pesto at Boulette’s Larder made my list of favorite dishes. This year, it was a comforting plate of poached eggs nestled on a creamy bed of spinach and cardoons. Perhaps it was the setting sun, streaming through the dining room windows, that made this sliver of salmon glow a particularly brilliant shade of red when it alighted on our table, glistening with a butter and brown sugar glaze. Regardless, the flavor of smoke and sea (brined in saltwater and smoked for six hours), lubricated by the fish’s waxy fat, was just as intense as the color. Left at one bite, I would have felt cheated; at three, it would have been too much. At two, it was perfect. We drove forty minutes outside of Santiago to Doña Maria’s road-side shack for empanadas, which she bakes in dung ovens (they’re not traditional unless they’re baked in dung ovens, so they say). Her empanadas were great, especially the crust, which was more lardy than flakey, with golden-brown blisters all over. But her pork ribs, which we ordered as an afterthought, knocked my socks off. These hefty pork ribs were rubbed with spices, and then smoked until the meat brimmed with juice and fat. They were amazing. I’ve tasted this dish through a number of iterations this year. I’ve had it with sea bream, spot prawns, king crab, and black cod. But the underlying sauce – a brothy curry (a mix of spices that Joshua Skenes calls “swarnadwipa,” inspired by spices and stories he learned from his friend Jing Tio, owner of Le Sanctuaire) enriched with coconut oil, and fragrant with kaffir lime – remained consistently magical, a warm, comforting expression of every flavor sensation my mind can comprehend, and yet, taken together, I cannot adequately articulate – salty, sweet, spicy, umami, floral. Hidden beneath the seafood were slivers of rangpur lime, which brightened the dish with acidity. Although any one of the versions of this dish that I had would have ranked on this list, I preferred the sea bream and black cod versions for the plantain chips that topped the fish; this dish needed some texture and structure. It really is splitting hairs, but I preferred the black cod, for its particularly buttery texture, over the sea bream. 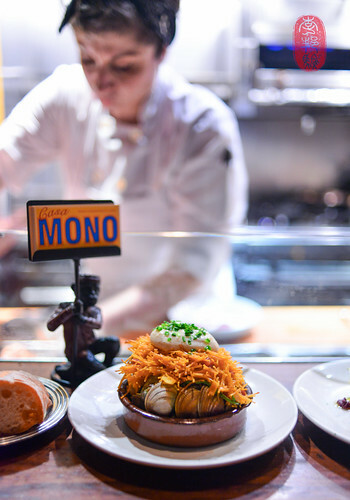 I ate this dish standing, while cooks and servers swirled around me, hustling to plate and run dozens of dishes to a room full of guests at a Friends of James Beard Foundation dinner at this year’s Music To Your Mouth Festival. I was hired to photograph this event, so I didn’t have time to sit and eat. But, in an unsurprising stroke of Southern hospitality, every one of the guest chefs made sure there was an extra plate for me. And for that, I’m very grateful, especially because I got to taste Sean Brock’s grouper head stew, a hearty, tomato-based postcard from the Carolina Lowcountry. This saucy stew – piping-hot, as Brock insisted – was poured over a bed of fragrant Carolina gold rice. On top, there was a filet of catfish – super-clean-tasting, farm-raised catfish from Rob Mayo at Carolina Classics – and a tender stalk of okra coated in benne seeds. For that brief moment that I tucked in, the bustle of service around me faded away as I disappeared into Brock’s retelling of Gullah cuisine. It was just an oyster. But it was an unforgettable one. It had been smoked in the shell, gently, for hours, until the surface of the oyster darkened, concentrating the flavor of smoke and the ocean in a caramelized layer that was not thick enough to be called a crust, and yet firm enough to seal in the warm, creamy interior. To say that I went through the trouble of flying back to Seattle and driving two hours to Lummi Island, with a ferry ride across the sound in between, just to have this oyster a second time this year is probably a stretch. But it was definitely a motivating factor. I’ve had this dish about a half a dozen times this year, both with black and white truffles shaved over it. And every time, I was amazed by how perfectly the rice was cooked. The pearly kernels were consistently tender, yet firm; firm, yet tender, and enrobed in a starchy glaze the viscosity of velvet and the flavor of the sea (the rice is cooked with a bouillon of aged seaweed). 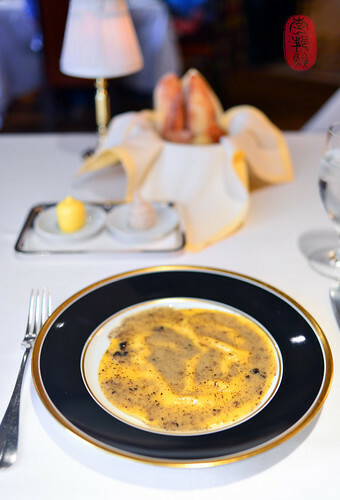 Chef Joshua Skenes nestled a quivering spoonful of Parmesan “chawanmushi” in the middle of the porridge and finished the dish, table side, with a shower of shaved truffles. Altogether, it was a masterful marriage of Western and Eastern umami, a brilliant transposition of Italian and Japanese cookery. And, it was the best dish I had in 2013. 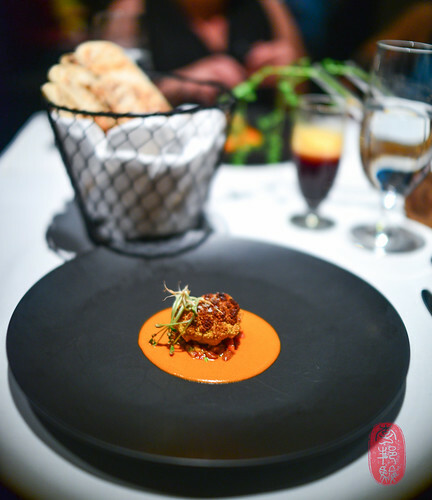 CLICK HERE to see ten more dishes from 2013 that I found exceptional and worth mentioning. A note on bread: I don’t count bread as a “dish” for the purpose of this list, even though, on the rare occasion that I find great bread, I eat as if it were an entire meal. But, I can’t let this post pass without mentioning four restaurants that I visited this year with exceptional bread. It seems almost silly to mention it, but Bar Tartine in San Francisco serves great bread. Of course, everyone knows that. But if you don’t, you should. Also, the bread at kadeau in Copenhagen is extraordinary. It’s my ideal bread. It has an incredibly thick, meteor-like crust, and a sturdy, textured middle. At the restaurant, it’s served with slightly soured, cultured butter. An acquaintance of mine, Simon Hansen, who is now a sous chef at the restaurant, was kind enough to send me the recipe. In addition to water, yeast, and organic wheat flour, the dough contains beer, yogurt, oats, and a dash of salt. The dough is proofed in the icebox overnight, and baked without any extra kneading. The hearth rye bread at Willow’s Inn on Lummi Island also deserves a mention. On my second trip to the restaurant this year, I ate half a loaf by myself. Like the bread at kadeau, the bread at Willow’s Inn has a crunchy rind, and a hearty, whole-grain interior. Chef Blaine Wetzel serves his bread with both butter and schmaltz (chicken drippings) fortified with chicken jus. And, even though it’s not my kind of bread (if you haven’t been able to figure it out, I’m strictly a crust kind of guy), I must acknowledge Shawn Gawle’s Parker House rolls at saison. They’re fluffy, and buttery, and beautiful, and served with house-churned and cultured butter made from Straus Family Creamery milk. For those of you who like this cottony kind of carbohydrate, I’ve had none better. Photos: Caviar, and all of its accompaniments at alinea in Chicago, Illinois; the curry-roasted cauliflower at Next: Vegan in Chicago, Illinois; cauliflower and pine, with horseradish cream at noma in Copenhagen, Denmark; the “piena luna” at Del Posto in New York, New York; and the koshi hikari risotto with Parmesan custard and white truffles at saison in San Francisco, California. ~ by ulterior epicure on January 2, 2014. Interesting to see the Aborted Etoloma on your list. I actually had to look at the photo to remember which dish it was. So, obviously, it didn’t make the same impression on me that it did on you. I’ve had the Piena Luna; however, the plating was quite different from yours, i.e., folded over and not nearly as much black truffle. I liked it but have had other pasta at Del Posto I liked more, namely, the Orecchiette with Lamb Neck Ragu, Orange Carrots & Toasted Rye, which totally blew me away. Amazing. Each dish sounds(and looks) great. I am impressed that risotto would top the list. Rice in all its forms us my favorite food. Amazing. Each dish looks great. Interesting that risotto topped the list. Rice in all its forms is my favorite food. You’re pictures are always so amazing. Fav is the Casa Mono shot with sous chef in back ground. I’m hitting Saison next week now that I saw it made the list twice. You travel maybe as much as I do. Happy 2014! Love this, and thanks for the recommendations this year! You have inspired me to step up to the big leagues and purchase a higher end camera! @altfoodsnob: Congrats! What did you get? Good thing you did not pay for the caviar. It’s a $500 supplement to the already pricey meal. Bread has been an enormous thing in Denmark for the past years and it doesn’t surprise me that Kadeau was able to surprise you positively. As you mention that you have the recipe by hand, is it one that you are willing to share? I am sure that a lot of us would like to try the bread out in our homes.